This recipe should have been here a few years ago. Seriously. 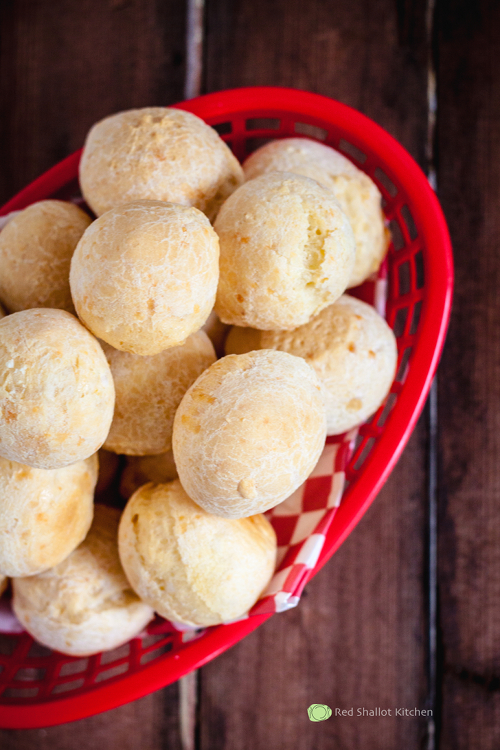 Because since we tried them the first time (at Fogo de Chao in LV) a few years back, these cheesy rolls have been our choice of bread to accompany many of our dinners at home. 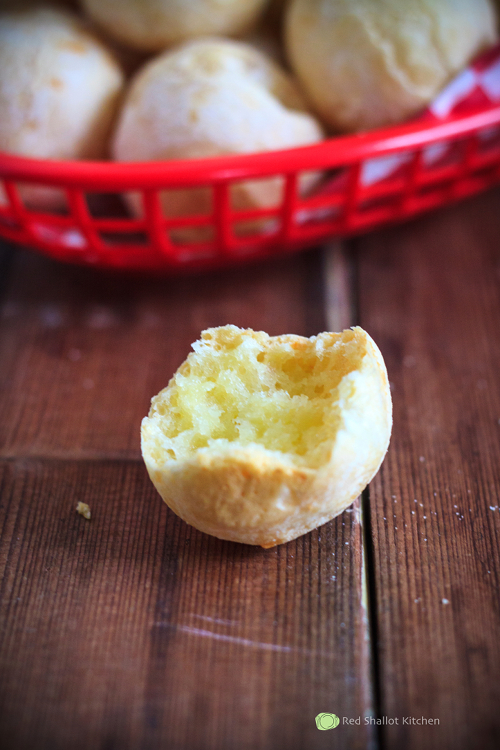 They're crunchy on the outside but slightly chewy in the center, and relatively easy to make. The only tricky part for most people is finding the right kind of flour for this. 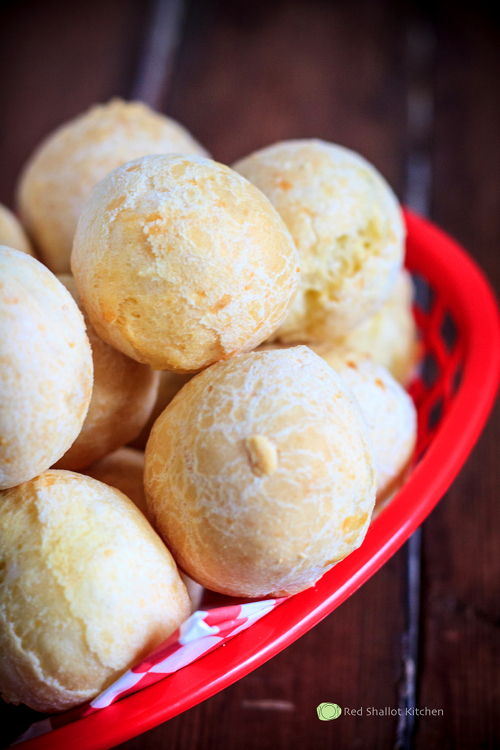 If you live in the area where there's a sizable Brazilian population, you should be able to find sour tapioca flour (povilho azedo) in a Brazilian/Latin America market (I got mine from Bossa Nova Brazil in El Cerrito, by the way). If that's not an option, you should be able to purchase one online from Amazon.com. Regular tapioca flour can also be used for a substitute. Although in my opinion, it's not the same since it lacks that slightly sour and fermented flavor. So don't change if you don't have to. And did I mention that in addition to being delicious, they are also gluten-free? In a large mixing bowl, combine flour, oil and salt, mix thoroughly. Add cheese, eggs and milk into the mixture, and blend until well combined. Line a cookie sheet with non-stick liner or parchment paper. Using a cookie scoop or spoon, scoop a round portion of the dough and roll into a ball (about 1.5 inches in diameter) using the palm of your hands. Place the balls on the lined cookie sheet with an inch space in between them. Bake in the oven for about 5 minutes. Reduce the oven temperature to 350 degrees F, continue baking until the balls turn slightly golden and crispy on the outside, about 15-20 more minutes. Serve warm. Would like to eat some. Have a look aboutNational cat day 2016 . Please visit my blog.